Exchange Server 2019 Preview is here! Today, long after its announcement at Ignite 2017, finally Exchange Server 2019 Public Preview was released. The Product Groups’ post contains information on the changes and features introduced with this Exchange 2019 Public Preview version, some of which were already teased at at Ignite 2017, e.g. session BRK3222 (announcement) and BRK3249 (Modern Authentication on-premises). The most noticeable changes included in this Public Preview are summarized below. But before continuing, you can start downloading the Exchange 2019 Public Preview bits here. No official statement on required Forest and Domain Functional Levels, so it’s the same for Exchange 2019 Preview as for Exchange 2016, which is Windows Server 2008 R2 minimum. That might change at release time though, as Windows Server 2008 R2 is already in extended support. With WS2012 going out of mainstream support in October, WS2012 R2 is the most likely FFL/DFL requirement. The build number of the preview is 15.2.191.1; the schema version for Exchange 2019 Public Preview is the same as Exchange 2016 CU7 and later, 15332. Exchange 2019 Public Preview can be installed on Windows Server 2016 as well as Windows Server 2019 Preview, both Desktop Experience and Core editions. Yes, Exchange 2019 runs on Server Core! In fact, the Exchange team really want you to try running it on Server Core. Also, by running on Server Core, you are reducing the potential attack surface, which makes it more secure system. Exchange 2019 can take advantage of hardware developments, and will support a larger number of cores as well as memory. Where Exchange 2016 scaling support was limited to 24 cores and 192GB of memory, Exchange 2019 will happily support up to 48 CPU cores and 256GB of memory. Search will leverage yet another a new engine, Big Funnel, which is already being used for Exchange Online. Result of this change is that indexes will no longer be a separate ecosystem of files per database copy, but will be stored within the mailbox database. The advantages of this are that indexes will leverage the existing replication mechanism and protection offered by the Database Availability Group, and as indexes replicate with the data, this also means no more rebuilding of unhealthy indexes or trailing content indexes. This is also beneficial for fail-over times. Exchange 2019 will support tiering of storage using SSD’s at release time, but that is currently not enabled for the Public Preview release. SSD’s are going to be used to store (read/write) hot data in a sort of intelligent cache, lowering overall latency and in the end benefitting user experience. The new Calendar Sharing model from Office 365 will be ported to Exchange on-premises. More information on this feature in Exchange Online here. 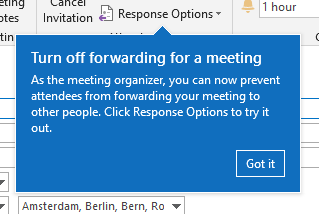 Also in the ported functionality department, it will be possible for meeting organizers to set Do not Forward for meeting requests, preventing attendees from forwarding those meeting requests to others. And last but not least, administrators will receive some convenient PowerShell cmdlets to manage Calendars, such as Remove-CalendarEvents for cancelling future meetings on attendee and resource calendars, and Add-MailboxFolderPermission gets the SharingPermissionFlags parameter to assign delegate permissions. Migrate to Skype for Business Server 2019 using Cloud Voice-Mail. Migrate to Office 365 with Cloud Voice-Mail. No official statement yet, but if the policy set by Exchange 2016 and Exchange 2013 continues, only Exchange major version n-2 will be supported for co-existence, meaning Exchange 2013 and later for co-existence, and the need to leverage Exchange 2016 when migrating from Exchange 2010 (EOL April 2020). No word yet on supportability, so assume the same policy as for the latest Exchange 2013 and Exchange 2016 CU’s, which require .NET Framework 4.7.1. No information yet if .NET Framework 4.7.2 is or will be supported. The required UCMA for Server Core is provided with the ISO, and is located in the UCMAredist subfolder. Of course, with Ignite coming up end of September, it is expected a lot more will be disclosed on the new Exchange release, such as guidance on the deprecation of UM, deploying Modern Authentication, storage tiering and Core support. Needless to say, this is a preview. It’s great to play with in a lab, but don’t install it in your production environment unless you are part of the TAP program. I repeat, this is not intended for your production deployment. Finally, the update of the Hybrid Configuration Wizard app with integrated Licensing feature was released today as well. You can access it at http://aka.ms/HybridWizard. This entry was posted in Exchange, Exchange 2019 and tagged Exchange2019, Preview by Michel de Rooij. Bookmark the permalink.